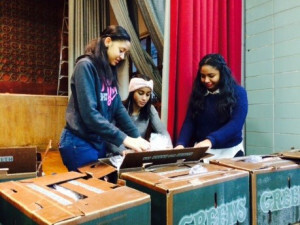 During Inwood Academy for Leadership’s first two months of Season of Service, students, families, and staff helped many of its neighbors most in need. This new IAL program also helps us reinforce a simple message to our students: that we all can be leaders by making a difference. In November, we partnered with over twenty organizations to launch #UptownGoGreen to feed thousands of families in northern Manhattan. Our middle school served as the distribution hub for over 10,000 pounds of food, 500 pounds of which were collected at our two buildings. Forty IAL students, parents, and staff joined dozens of other volunteers to prepare bags that were distributed at eight locations. our IAL Middle School Students, who raised money for the purchase of warm accessories and toiletries, which were distributed to HIV patients at New York Presbyterian Hospital. With every school-wide season of service event we are setting the example that our service is the best holiday gift we can share. Season of Service will continue until Saturday, January 18, after Martin Luther King, Jr.’s birthday. Thank you to all who have contributed to the Season of Service. To get involved, please contact angelo.ortiz@inwoodacademy.org. 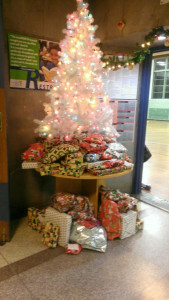 Click here to see pictures of one of the distribution sites.